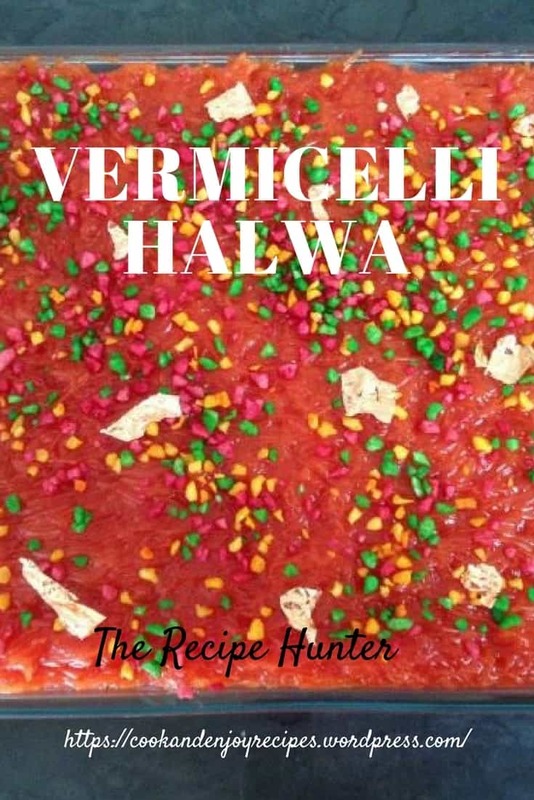 Vermicelli halwa is an easy dessert to prepare. It is loved by many for a light snack or as dessert. 3 cups normal white sugar. 1 cup almonds halved and coloured. 2 tsp yellow food colouring. Fry the vermicelli and margarine in a pot until golden brown. Add the boiling water, sugar and elachi powder, as well as the rose essence and food colouring. Continue stirring to prevent the mixture from sticking to the bottom of the bot. Allow cooking till the mixture starts to pull away from the sides, roughly 10 minutes. Empty the mixture in a greased dish. Sprinkle the coloured almonds over the top and if you want to you can sprinkle gold dust over as well. Pop into the fridge to set overnight. When you are ready to serve cut the Halwa into diamond shapes and serve.